September 2017 – RallyNews – Patterson Pacenotes Extra's…..
Thursday nights haven’t quite been the same for rally enthusiast’s in Ireland since RPM departed our TV’s screens a couple of year’s ago, but somewhere deep in the County Down countryside, the RPM production crew have been not been sitting idly by. Instead, RPM’ s Plum Tyndall has put together a brilliant new three volume DVD box set featuring seven of the fastest and exciting Irish drivers not already featured in the RPM “Tarmac Titan” series. 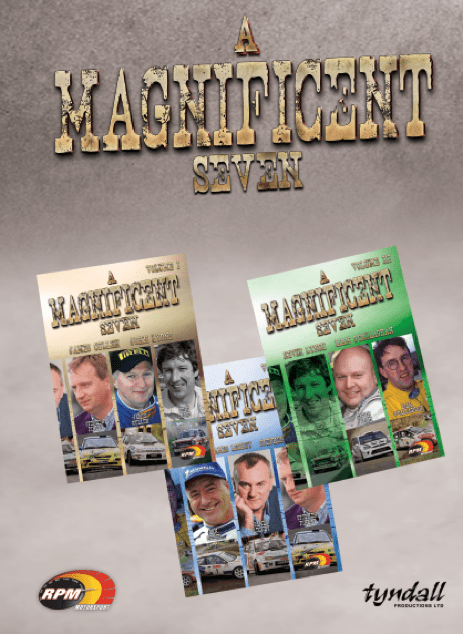 The featured Drivers are: JOHN LYONS – the Belfast bank official who could have gone professional; JAMES CULLEN – the Donegal driver who fought to win and beat financial burdens; STEPHEN FINLAY – who shone on the stages but shied from publicity; JAMES LECKEY – Down’s sensational short-stay racer; IAN GREER – The quiet and quick Hillsborough driver; LIAM O’CALLAGHAN – Cork’s determined stage star who came from a rallying family; KEVIN LYNCH – the County Derry novice, a winner from the outset. These epic DVDs can be purchased online in three separate volumes or as a box set. Clare Stages 2017 – Sample Video & Stage Speed Traces. The Clare Stages Rally 2017. Clare MC have put together a fine combination stages for the 2017 event. A good mixture of surfaces and roads, from fast and flowing to narrow and technical, it will, without doubt, challenge all the crews in the right way. Below is a short sample video along with our usual stage data samples.